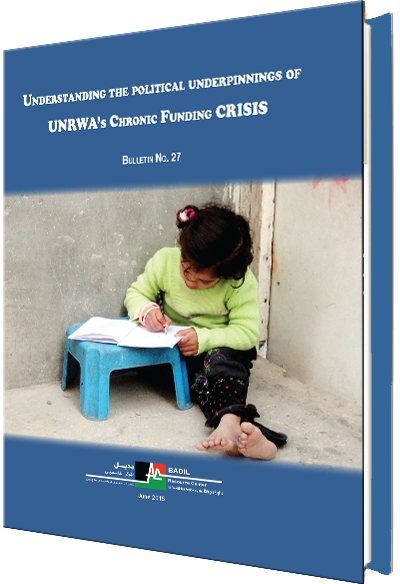 BADIL announces the release of its 27th Bulletin: “Understanding the political underpinnings of UNRWA's Chronic Funding Crisis” calling upon the UN General Assembly and the wider international community to take urgent action to remedy the Agency’s financial deficit. UNRWA began 2018 with a shortfall of $150 million following a $126 million deficit in 2017. The Agency’s financial stability was further jeopardized earlier this year following a decision by the US administration to cut its contribution by half, transferring only $60 million of a planned $125 grant to UNRWA. Concerns about UNRWA’s deteriorating financial situation were raised at UNRWA’s Advisory Committee meeting earlier this month, as well as at the Pledging Conference for UNRWA held in New York. In light of recent events, BADIL aims to highlight the responsibility of the international community vis-à-vis Palestinian refugees, and by extension UNRWA. The Bulletin highlights the structural obstacles in UNRWA’s funding framework, together with concerted and strategic political efforts by Israel and the US administration to delegitimize and dismantle the Agency resulting in the present financial crisis. The Agency’s short-term but renewable mandate and the absence of mechanisms to address the natural growth of the Palestinian refugee population, together with the predominately voluntary funding system which is adversely susceptible to world politics, have resulted in a chronic funding crisis for UNRWA and decreases in the quality and quantity of services provided to refugees. Underlining the responsibility of the international community to ensure Palestinian refugees receive the humanitarian assistance and rights-based protections to which they are entitled, this Bulletin enumerates a number of steps to achieve sustainable resolution to UNRWA’s predicament. BADIL imperatively recommends that: UN Member States must ensure sufficient funding for the financing of UNRWA’s essential services and programs, and in cases where voluntary donations are insufficient, the UN General Assembly must compel Member States to contribute to the funding of UNRWA’s budget. UNRWA’s funding crisis is of grave concern and must be adequately and resolutely resolved by the international community. This Bulletin is published amid a number of BADIL initiatives and interventions to address the negative politicization of the Palestinian refugee issue, with specific attention to the underpinnings of the UNRWA funding crisis. BADIL began an awareness raising and advocacy campaign this year, beginning in January with a statement, in Arabic and English, on the intensified renewal of aggressions against UNRWA by Israel and the US administration, calling for a strategic approach by the international community. In May, BADIL responded to erroneous and biased statements against the Agency made by the Swiss minister, Mr. Ignazio Cassis. Releasing another statement on 29 June, BADIL brought to light additional pressures facing UNRWA and their potential consequences on service and assistance delivery to Palestine refugees.